Students at Denver's South High School staged a walkout in solidarity with protesters across the country on Monday. The protest followed a week of coordinated walkouts at several Denver high schools, to call attention to the grand jury decisions in the case of Michael Brown and Eric Garner. According to CBS Denver, on Monday at 11 a.m. hundreds of students at South High School walked out of class and marched on Broadway towards the state Capitol, surrounded by a huge police presence. This is the fourth day of the student led walkout, which KDVR reports was coordinated in conjunction with school officials and local police. The students reached the Capitol around 11:30 a.m. Some were heard chanting "F*ck the police." From the Capitol, many students walked to East High School, where the first major student protest happened last week. 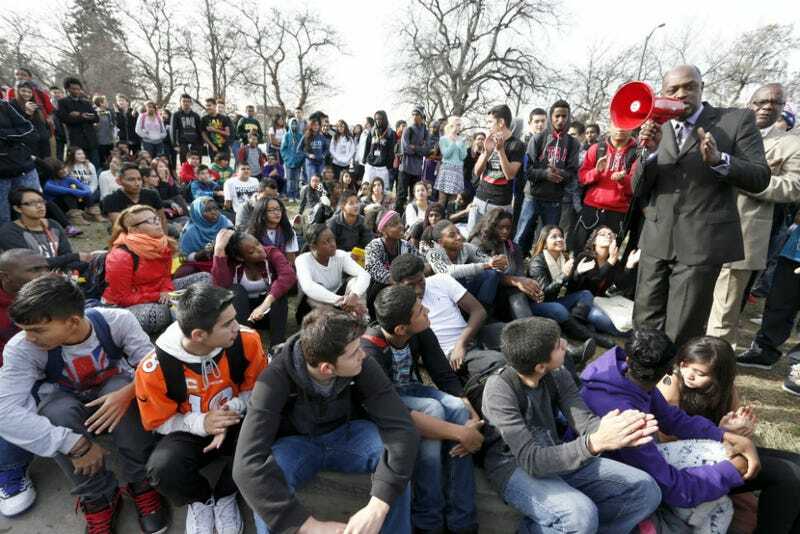 While at East High, Pastor Reginald Holmes, a pastor for the New Covenant Christian Church in Denver, told the students that, "We need authority. We respect authority. We just want authority to respect us." Students boarded buses that took them back to school around 12:15 p.m.
Students from Lincoln, Montbello and George Washington high schools walked out of class on Thursday morning. Four bicycle police officers who were escorting students were injured during Wednesday's walkout at Denver's East High School, when a car struck them. One of the officers was critically injured; no charges were filed as a result of the incident. Denver Mayor Michael Hancock offered support of the students and their protest but urged them to remain in school moving forward.